A REFERENCE TO THE 1970s is nothing novel in fashion. About five years ago, designers began to mine the bohemian and rock’n’roll elements of the decade, and even now, floaty maxi-dresses, cotton eyelet blouses and brown suede jackets continue to line store racks. As far as denim goes, the era’s jeans (flares, high-waist straight legs) have gotten the lion’s share of attention, but now the spotlight is shifting to the denim skirt. As in this 1974 image of Lauren Hutton, shot in New York for the Daily News’s Sunday Magazine, the fabric, with its workwear roots, takes on feminine allure when draped around a woman’s waist. This spring, denim and ready-to-wear brands alike are showing variations on Ms. Hutton’s cornflower-hued skirt. From Madewell’s button-fly pencil and Levi’s patch-pocket A-line to Chloé’s light wash, all share a hint of the denim-obsessed decade. The lingering influence of the era is understandable. “The ’70s is one of the first times women wore T-shirts and trainers and denim and casual clothes,” said Jessica Lawrence, head of design and brand for M.i.h Jeans, a London-based denim brand. “Dressing was so formal up until the late ’60s.” Fittingly, the decade’s icons like Jane Birkin, Mariel Hemingway, Ali MacGraw and Lauren Hutton had the sort of breezily bewitching beauty that could make jeans and other casual kit as elegant as haute couture. Simplicity rules, both when designing and wearing a jean skirt. 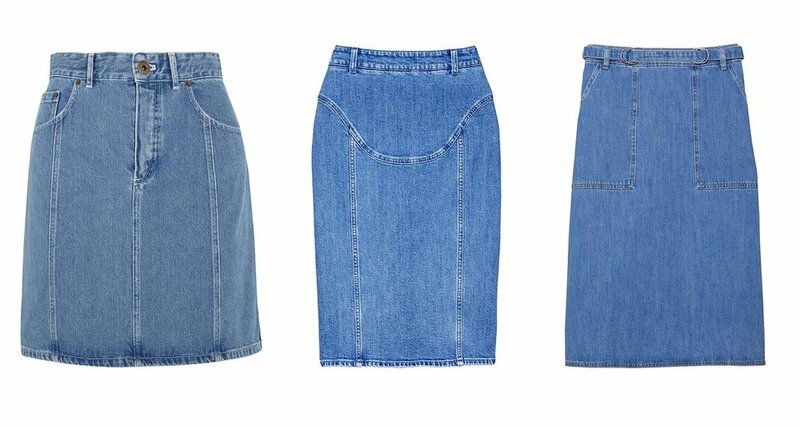 “If you think of Lauren Hutton or Jane Birkin, you think of a denim skirt that sits at the waist with a simple A-line,” said M.i.h’s Ms. Lawrence, who always offers at least one denim skirt per season. This spring, however, M.i.h has three. None is overwrought.